Considering the many advancements in today’s technology, it’s no surprise that a number of industries are adopting new and innovative ways to run advertising and market their business, and real estate is no exception. If you were to take a poll among real estate agents as to what the hardest aspect of their job is, they would most likely say marketing their real estate listings. Drone photography is quickly being adopted as a way to stand out and gain an edge on the competition. Once upon a time, listings in local newspapers and free homebuying guides were considered the norm, and subsequently, the best way to go. But since the inception of the internet, almost every potential homebuyer starts their search online or by using any number of real estate listing apps to broaden their search. With the market for real estate as competitive as ever, standing out among the sea of other listings is paramount to attracting positive attention to the homes you hope to sell. With recent advancements in photography and videos, more and more individuals in the real estate industry are looking toward drones as the new wave of the future of real estate marketing. What Can Drones Offer That Traditional Photographs Cannot? Well, for starters, drones offer an exciting high-quality experience through dramatic camera angles, 360-degree views of gorgeous, sprawling, rolling landscapes and open, airy home interiors, sweeping property shots, and exotic photographic angles. Drone photography offers an immersive experience for the prospective buyer with video and photographic tours of homes, landscapes, neighborhoods, and communities, making buyers feel as if they were actually there themselves. Thanks to the use of drones, realtors have been able to elevate the curb appeal of the real estate they promote by bringing the awe and magnificence of the physical tour into the digital realm. What better way to virtually see a house online than through a complete full-motion ultra-high definition tour? And if you are in the Hartland, WI area, then look no further than our real estate photography services to provide you with the best that drone photography has to offer. Mason’s years of experience in real estate drone photography makes him the perfect photographer to capture all those unique angles, picturesque views, and exquisite interiors of all your home listings. So how is it that drone real estate photography has become a thing? Since the FAA relaxed drone operating restrictions in 2016, many photographers have been able to hone their photography for real estate by incorporating real estate drones into their repertoire. And once the real estate community became wise to the opportunities that drones provided, the possibilities for marketing strategies became endless. Gain the Edge You Need to Move More Properties and Help More Sellers. Can showcase stunning aerial views of a listing’s entire property. Can provide details about the condition of a home’s roof and other features that may not be easy to access. Can show potential home buyers what their kids’ trek to school or their own drive home looks like. Can give potential homebuyers an idea of what the community looks like, including area businesses and other important locations and landmarks. Can showcase any new local developments in the town or neighborhood that might have an overall impact on tax dollars. Can give a live-action property map in lieu of one sketched out on paper. A drone’s videos are especially majestic and breathtaking. And with that in mind, there is all the potential for your material to go viral as clients, followers, friends, and even strangers share those videos through various forms of social media. Capture stunning views of entire communities with the single flight of a drone. What better way to attract buyers while showcasing all that a community has to offer around your listing than to provide them with a bird’s eye view of the neighborhood. Do your potential buyers have questions about the condition of a listing’s roof? Now, thanks to drone photography or video, you can show them the exact condition that the roof is in without too much of an explanation. After all, a picture is worth a thousand words. Having trouble marketing large lots of land or enormous investment properties? Forget Google Images and go straight for real-time drone photos and videos. Clients will have a clear and up-to-date picture of the property. Are your clients asking questions about the distance from one location to another? Do they want to know exactly how far the school is from home, or how far the post office is? Now you can show them instead of estimating those distances. Drones are a great way to show clients exactly how far point A is from point B. No more guesstimating. Since drone videos and photos are relatively new to the real estate market, you should be sure you are one of the first to take advantage of this hot new advancement. And since your fingers will then be on the pulse of evolution, this will make you one of the most sought-after, innovative realtors in your area. In taking advantage of all that drone photography has to offer, you will be offering your clients a fresh and exciting take on the world of real estate and home buying. Since drones offer full, lush, breathtaking views, now you can showcase the entire property and not just bits and pieces of it. In essence, you are helping estate buyers get a very real picture of the spaces you are listing. For example, if a basic photograph cannot capture the entire backyard space, a drone will be able to get into those areas that a camera lens could not reach. Oftentimes, people need to get an idea of the full picture before they can make a decision. Drones are a great way to fill in the blanks. As with any new type of technology, there are risks that come along with all of the benefits. For example, if operated by someone with little to no experience, a drone of any size can cause a considerable amount of damage to property and/or injure those around them. Aside from hiring a trained professional like Mason Seifert Photography, it’s also a good idea to consult with a trusted attorney to discuss potential insurance and liability issues. 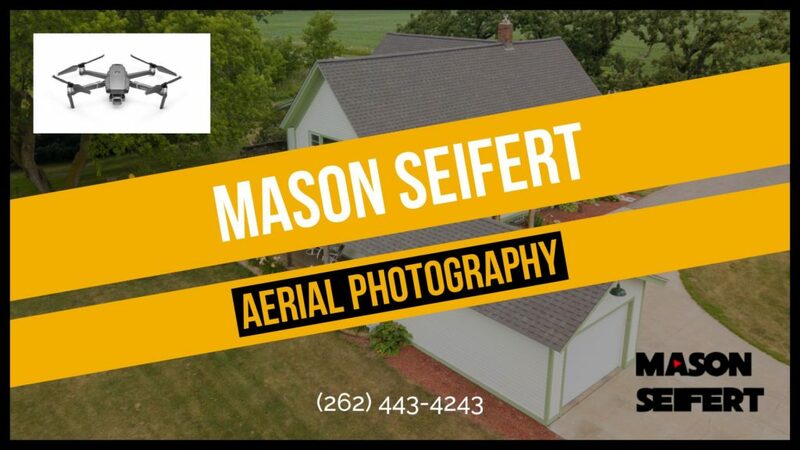 With years of experience and a passion for capturing the true beauty, versatility, and utility of any property, Mason Seifert has the talent you need to safely and accurately portray the properties in your portfolio in a way that attracts not just more buyers, but the RIGHT buyers that are willing to pay top price and move fast. Always ask for permission from homeowners before taking your drone off to the sky. Do not, under any circumstances, allow pets or children to run after the drone. As tempting as a moving object can be, it’s best to stop the game of chase before it begins. Thoroughly read the instruction manual and take the time to practice, practice, practice. They say “practice makes perfect” for a reason. Do not fly the drone over crowds of people. Only fly the drone over private property with the express permission of the homeowner. When used properly and for the right reasons, drone photography can easily lift, add life to, and accentuate your real estate practice. In fact, drone real estate is growing so fast in popularity that The National Association of Realtors created a resource page to help realtors understand the government’s drone regulations should they want to use drones as part of their real estate marketing strategies. In using drones and hiring a skilled drone photographer, you are offering your clients and potential homebuyers a way to invest more time into looking at listings that catch their eye. And considering all of the technical risks involved and skills that it takes to maneuver the complicated machine, it’s definitely safer and more cost-effective to hire a professional like Mason Seifert Photography to operate the drone. According to Tech Helpline, 10 million drones were sold worldwide last year, and that number is expected to triple by 2021. The drone industry’s value is expected to gross $90 billion by 2025. The National Association of Realtors reports that interest in using drones for marketing is growing among its members. A stunning 14 percent of its members already use drones for real estate marketing purposes, while 12 percent report that they know someone in their office who uses a drone. Still, 18 percent report that they plan on using drones for real estate marketing in the near future. Ready to Find out How Drone Photography can Help your Real Estate Business? 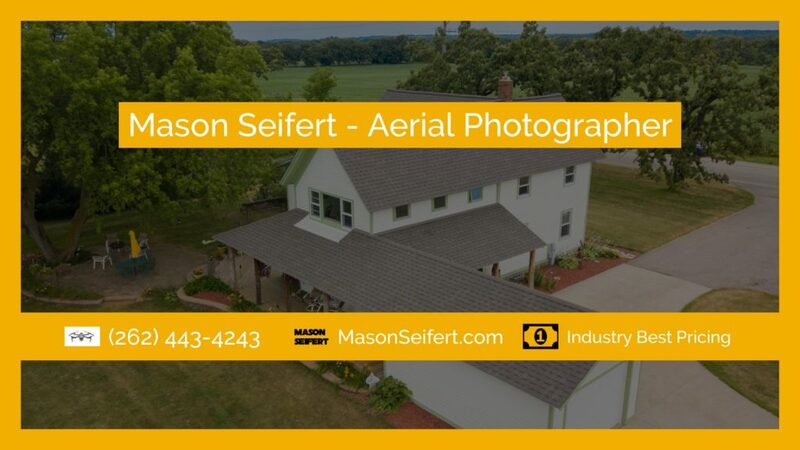 If you’re in the Hartland, WI area, give Mason Seifert Photography a call. Mason has shot over 200 homes to date and strives to present new and exciting angles when showcasing homes. Mason Seifert Photography has three packages to choose from depending on your unique needs. Packages feature outdoor photos, indoor photos, photo editing, aerial photos, video walkthroughs, video editing, and a one-minute video flyover of the home exterior, among others. If you’ve been searching for a photographer or videographer who thinks outside of the box while maintaining creativity and professionalism, then look no further than Mason Seifert Photography. Since the fall of 2016, Mason Seifert has used and continues to use different lighting, unique angles, and staging settings to differentiate himself from other real estate photographers working in the market. If you have been thinking of adding a real estate video marketing plan into your business, then Mason Seifert Photography has the experience and skills you are looking for in a photographer and videographer.